Ah ring, ring ye dear Christmas bells. Pouring a down from the skies. Collected by Joseph F. Keimig (1918-2013) during his time as a student at Marianist Preparatory School, Beacon, N.Y. or as a Brother of the Society of Mary (S.M. or Marianists), a Roman Catholic order of priests and brothers. Authorship and exact date unknown. 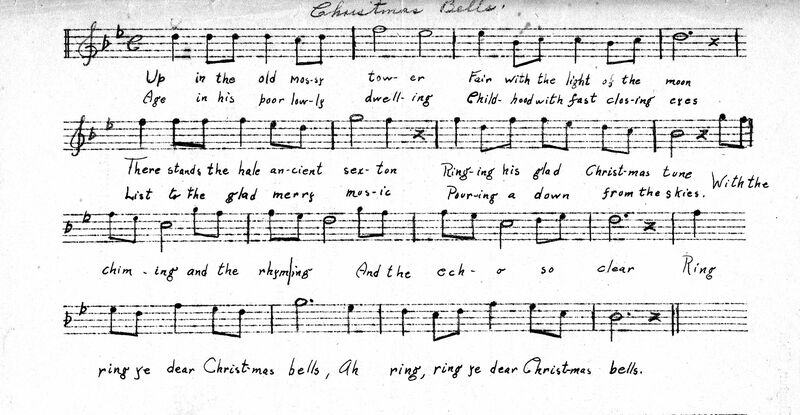 Text transcribed from hand-written sheet music or other notes. Noteworthy Composer sheet music created by Douglas D. Anderson and released to the public domain.